Sony's official specs incorrectly stated 8W of power. The correct rating is 18W, the article has been updated to reflect that. In the personal assistance arms race, the two real options for Android users are Google's Assistant and Amazon's Alexa, and both companies have realized that victory will require ubiquity—not as the final result, but as the means. To that end, each has opened its platform up for third-party hardware, and Sony's (un)imaginatively named LF-S50G takes advantage of Google's Assistant in the same way the first party Google Home does, seasoned with a few unique features like gesture controls and a clock. 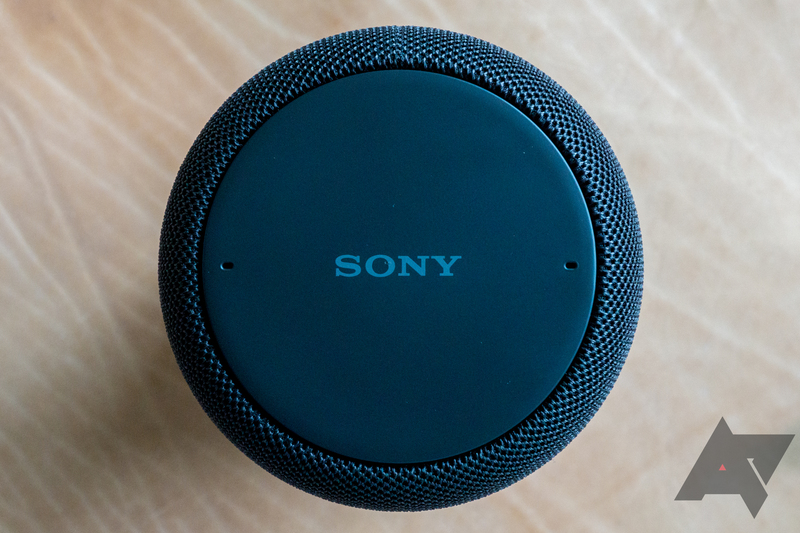 At around $200, though, I don't think Sony's speaker is worth the extra cash for most people over the $130 Google Home, unless you have particular requirements. They say that there aren't any bad products, just bad prices, and $200 is a lot to pay for an Assistant-powered speaker—especially one of just 18 watts. The extra $70 here only gets you a middling subwoofer, clock, and mediocre gesture controls. So while the LF-S50G does get a lot louder than other speakers might, it's up to you if the other features make the $70 premium worth it. Dimensions 4.33" (110mm) radius, 6.38" (162mm) height, 26.46 oz (750g). Speaker(s) One 1.9" (48mm) driver, one 2.09" (53mm) subwoofer. Connectivity 2.4/5GHz Wi-Fi (802.11a/b/g/n), NFC, Bluetooth 4.2. Power Consumption Advertised 8W, 0.5W in "Off" mode. 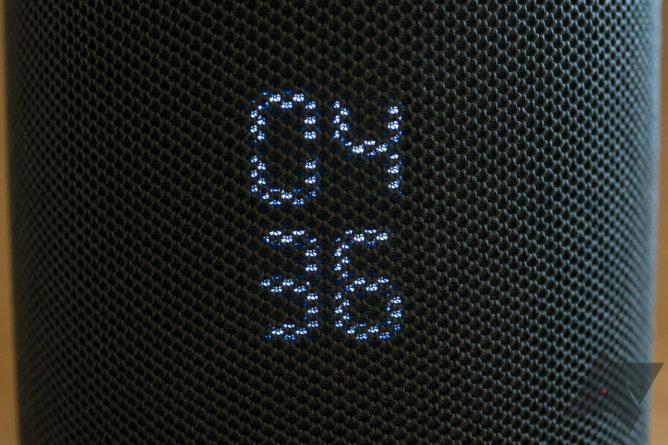 Clock Didn't think I'd be that excited about it, but having a clock on a smart speaker is great. Google should do this. Sound It gets pretty loud, and the quality is OK.
Design The woven fabric grille is nice to look at. Assistant Google Assistant is the best personal assistant solution out there. 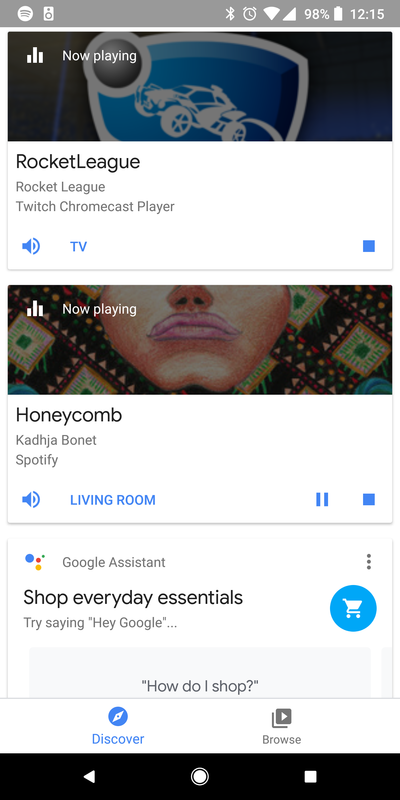 Google Cast As a target for Google Cast, it's easy to stream audio from supported applications. Bluetooth Anything Cast doesn't support can be done the old-fashioned way. Microphone It's quite sensitive, and does a good job canceling ambient noise. Gesture Controls A good idea in theory, but they work poorly. Sound, Again Poorly defined bass at higher volumes. Build Quality The removable grille makes the whole thing sort of creaky, doesn't inspire confidence. Water Resistance IPX3 is pretty mediocre. Price $200 is a decent amount of money for an 8W wired speaker. In appearance, Sony's LF-S50G is a 6.3" tall cylinder with a slight rounding to the top and bottom edges. It comes in two colors: white and black. I can't speak to the white model, as I didn't get a chance to play with it, but the black one's materials aren't the nicest. The base is a high-gloss metallic plastic, and my unit had some unfortunate mottling to the reflective finish, which I didn't find too attractive. The sides of the cylinder are also the speaker grilles. The exterior face is a reasonably finely woven synthetic fabric mesh. Beneath the fabric is a perforated semitransparent plastic shell. With a quick twist it pops free of the speaker, perhaps for easy cleaning. The two drivers face one another, firing against a cone mounted between them. Ostensibly one of the two speakers is a subwoofer (Sony calls it that), but with the size difference between the two being a whopping 5mm, I honestly can't tell which it is visually. I think it's the top one, given the padded bass port connected to the chamber behind it. Beneath the grille on the front is a clock, probably the single most visually distinctive feature of the LF-S50G. It's a seven-segment time display with blue-white leds. The numerals are around a centimeter tall, with the two-digit hour set above the two-digit minute. 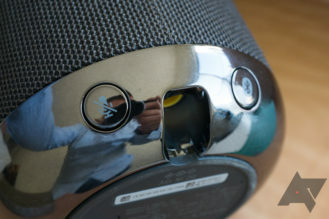 The top is not part of the removable grille and is plastic, with two holes for two microphones. The flat space is also the detection area for the gesture inputs the LF-S50G accepts. The back has a plastic NFC badge where the antenna for Bluetooth setup is. Beneath that on the bottom edge are two buttons for manual Bluetooth setup and disabling the mic, as well as power input. The bottom of the speaker has two more buttons, one of which toggles lighting for the illuminated clock, the other locks the device from accepting input from other buttons or gestures. The setup process for the speaker isn't difficult. Plug it in and install the Google Home app from the Play Store. On launch, the app should tell you that it's found a device that needs to be set up. Setting up the speaker is easy. 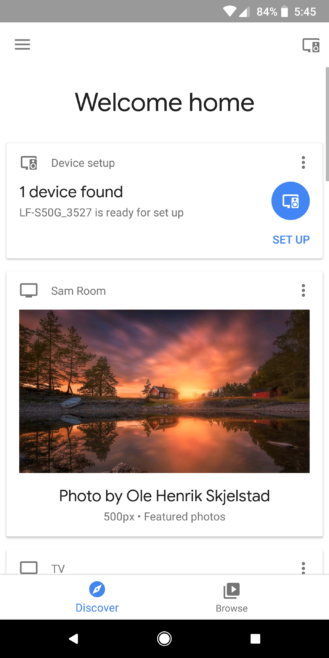 From that point forward, Google holds your hand through the setup process, including connecting it to Wi-Fi, training your voice model for recognition, and providing you some options for customization like linked services. So long as you follow the instructions, you can't really mess up, and everything can be changed later if you decide to make any modifications. Controls in the Home app. Once you're done, you're ready use the LF-S50G as a linked Chromecast speaker, fire off messages, and send commands to smart home devices (among a longer list of Google Assistant features). 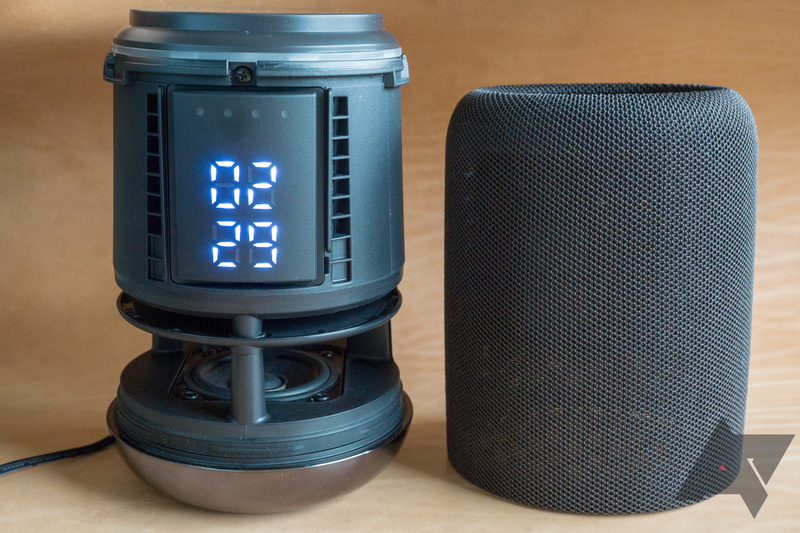 If your home starts filling up with Assistant-powered smart speakers, you can also set them up in groups for multi-room listening. 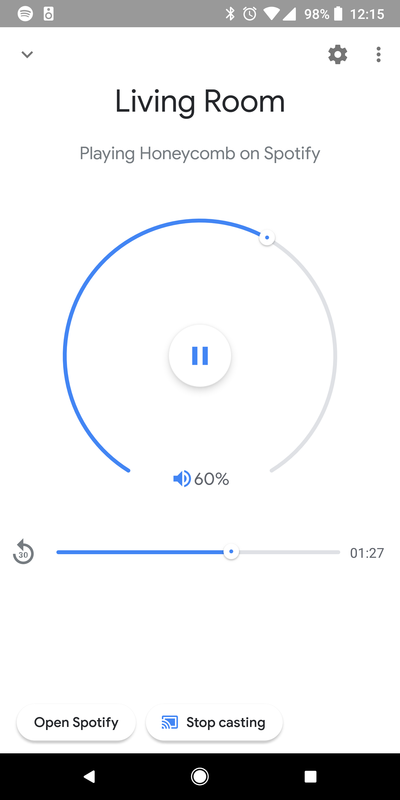 For more information on how to configure your new speaker in the terribly designed Google Home app, you can read up on the different settings or check our complete guide. If you've used Google Assistant on a phone, it's (mostly) the same thing. You say the "OK Google" or "Hey Google" hotwords to trigger it, and from there you make your request. 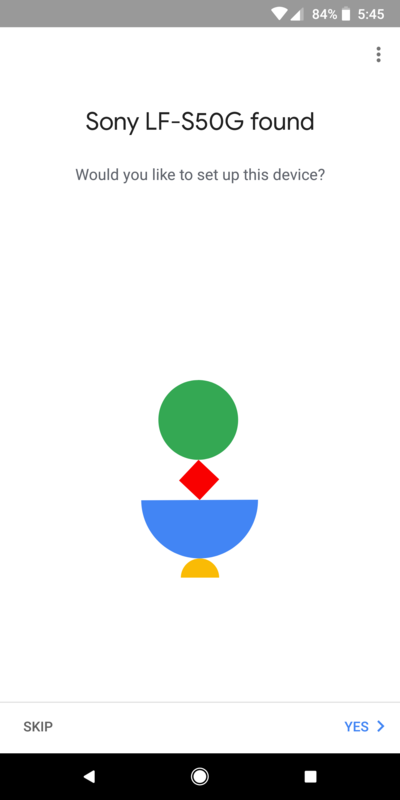 If it's something Assistant can do, it does it (or tries to). If not, it tells you so. There are some noteworthy differences between Assistant on its various platforms. For one, placing calls isn't possible on all devices, including third party hardware like the Sony LF-S50G, and messages aren't supported on any standalone Assistant-powered hardware. Just like above, we have more detailed coverage on how to best use the Assistant elsewhere, but suffice it to say the experience here is almost identical to what you'd expect from first-party hardware like the Google Home and Home Mini. The LF-S50G eschews hardware buttons for a gesture based control system. The idea seems quite futuristic: with a wave of your hand you can control the speaker, pausing or increasing volume effortlessly. There are other advantages too, like being able to pause playback to answer the phone while your hands might still be dirty from the kitchen. With a half-hearted flop of the wrist you can wave away music like an intrusive fly. It's a great idea. It's too bad that the gesture controls are actually pretty bad. 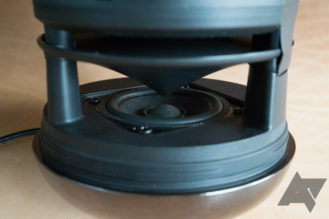 In fact, they were the single most frustrating thing about the speaker. Adjusting volume up or down was incredibly imprecise. It would either crank up or down on the arbitrary 0-100 scale far too quickly, or just ignore input. Dialing in any value to within 5-10 of what you want is difficult—as you'll very likely swing right past it a few times and it requires a lot of concentration and patience to get it to work correctly—which defeats the purpose in my opinion. Other gestures for play/pause, next/previous track, and Assistant trigger were easier to use, but even then I'd have some missed inputs. The gestures also seem superfluous. I mean, it has a microphone. As far as hands-free controls go, that's a whole lot better. If I'm waving around with dirty hands in the kitchen, I may not be touching a button, but I'm still going to drip or drop things straight down onto it—right where the mic holes are. My voice has the benefits of more precise and varied controls at a simultaneously greater range. The gestures controls aren't just imprecise and difficult to use, they're entirely eclipsed by a better alternative method of input. I'm left wondering, what's the point? Every command the gestures register has a vocal equivalent. 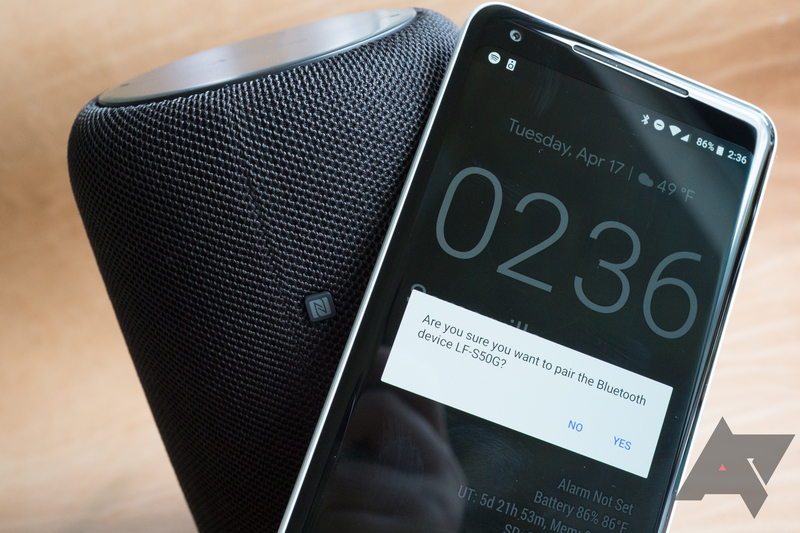 Like many smart assistant speakers, it's able to connect via Bluetooth, and setting it up for that is easy. Just press and hold the Bluetooth button on the back bottom of the speaker to flip it over into pairing mode, at which point it becomes a discoverable device for your phone, tablet, computer, etc. 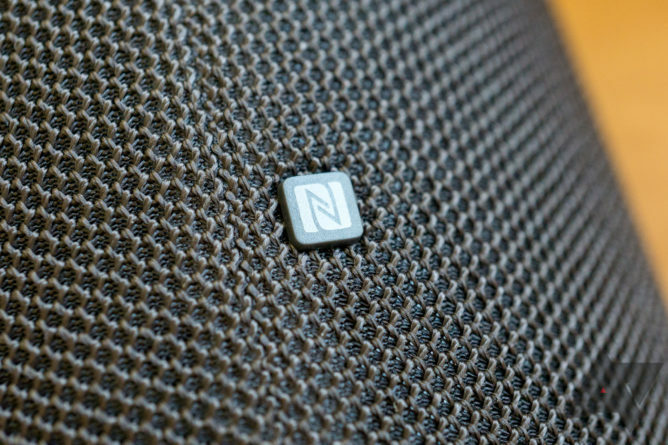 It also has NFC, so with a quick tap devices can also connect without any of that hassle. I mostly used it as a standalone device/cast content to it, but I was able to use it as a Bluetooth speaker pretty easily, and it seemed to work and sound OK, though there was a difference in quality casting music vs. Bluetooth. I assume it doesn't support the higher-quality wireless audio standards like AptX. I expected the LF-S50G to have some decent bass given the dedicated subwoofer it's supposed to include. 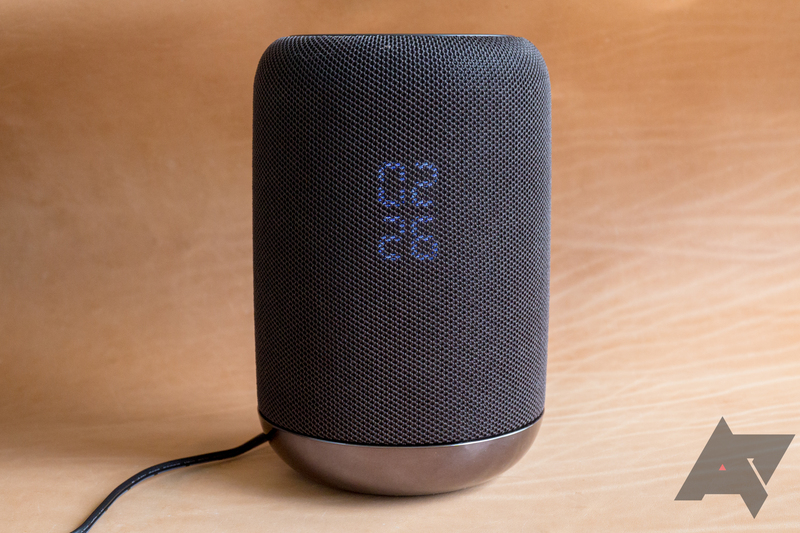 While it does deliver stronger bass than the first-party Google Home, it's limited in range, with definite frequencies in which response is stronger. I might be nitpicking since it's just an 18 watt speaker, but across the board the speaker could use a bit more tuning by Sony. In the middle of its volume range (around 40-70 on the 1-100 scale it uses for volume), it sounds its best. Below that the balance between treble/bass seems a bit off, and above that it's pretty much all mids and treble. I don't doubt that the lack of louder bass is due to the limited power and size of the woofer, but that extra volume range isn't really useful if it's all on the high-end. If fatiguing mids is your jam, at least Sony's speaker doesn't suffer much from distortion at high volumes. With the removable grille and small drivers, I expected at least a bit of a rattle or some shrillness with it cranked up, but there wasn't any. Apartment dwellers can rest easy knowing they'll be able to disturb their neighbors with clarity. 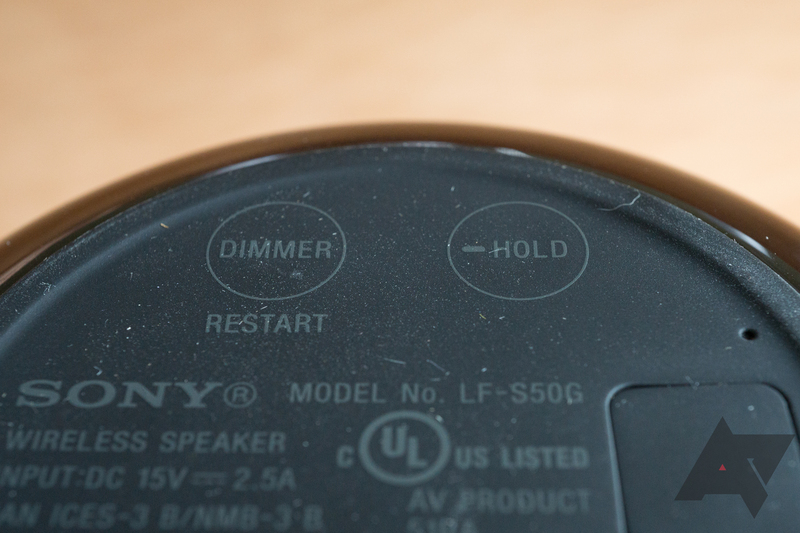 An unfortunate thing to note: at high volumes, Sony's speaker has a bit of trouble picking things up on its mic, so if you accidentally turn things up to 11, you'll have a bit of a time trying to 'OK Google' yourself to a lower volume. In my opinion, that's totally forgivable—it gets quite loud. One other curiosity I discovered is that the speaker sounds a bit better with the grille removed, though it isn't very attractive without it. Bass performance was also improved somewhat by having it against a wall. The sound quality is perfectly acceptable (though perhaps not at this price), and it's definitely better than the stock Google Home or Home Mini, but I had hoped the inclusion of a dedicated subwoofer would have resulted in better bass. I'm not sure how it stacks up compared to the similarly-priced JBL Link 20, though. Rita reviewed that speaker, and based on the volume of her praise, it may have better sound. Unless you're really into the idea of gesture controls, I'd pretty much ignore the fact that this speaker has them. They don't work well enough to be a point worth considering. That leaves just a few remaining feature advantages over other speakers: the clock, the sound quality, and the IPX3 water resistance. 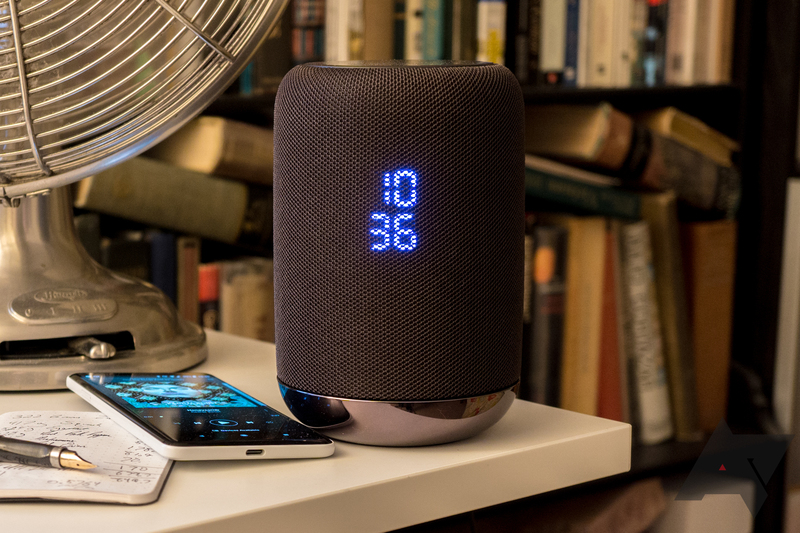 With speakers like the JBL Link 20 having a superior IPX7 rating, dual 10W speakers, and a built-in 6000mAh battery, the Sony LF-S50G just has... a clock. Well, that and a list of new disadvantages, since it's less powerful, lacks a battery, has poor gesture controls, etc. It's up to you if that makes the $200 speaker worth it. I won't lie, the clock is really useful, and I think every speaker should have one. There's really no reason not to include one, and Sony's implementation behind the grille even looks kind of nice in a sort of anachronistic way. Frankly, I'd pay $20 for that feature by itself. But every use case is different, and for most people I imagine the cheaper first-party Google Home is enough. At the $200 price-point, JBL's Link 20 beats the LF-S50G on specs. 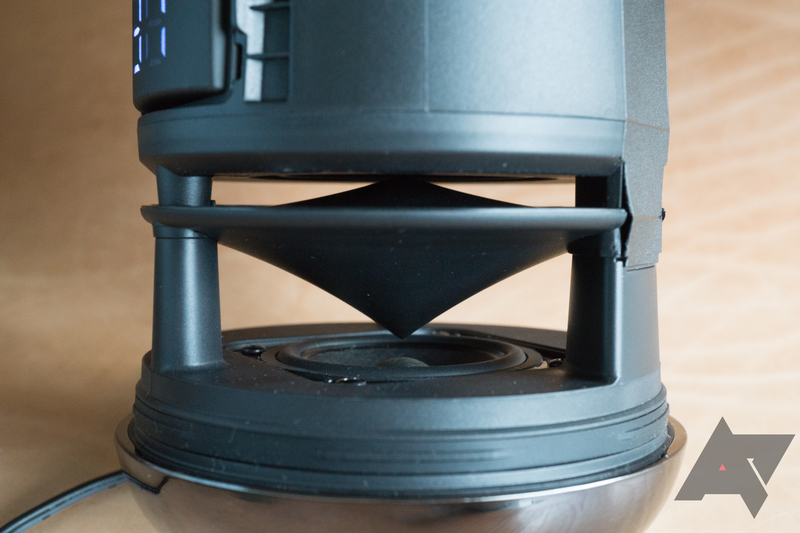 That leaves Sony's speaker in a weird position where it probably won't appeal to many people.